However, that’s one of the biggest mistakes you can make when decorating your home. 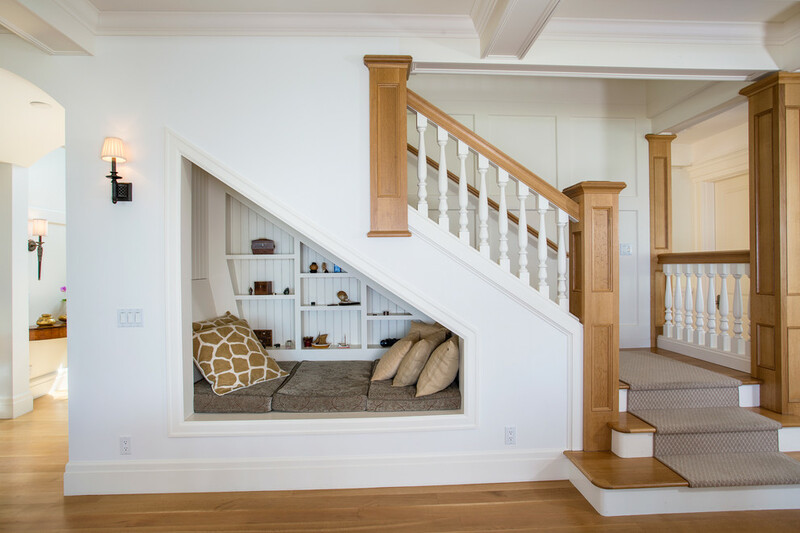 Never underestimate any space you can utilize, and today, we’re going to talk about how you can use the space under the stairs. Extra space is always welcomed in the home. 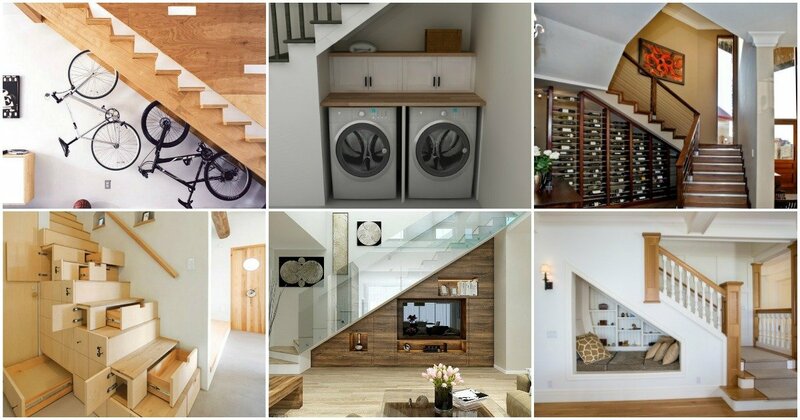 And the one under the stairs can serve several different purposes. 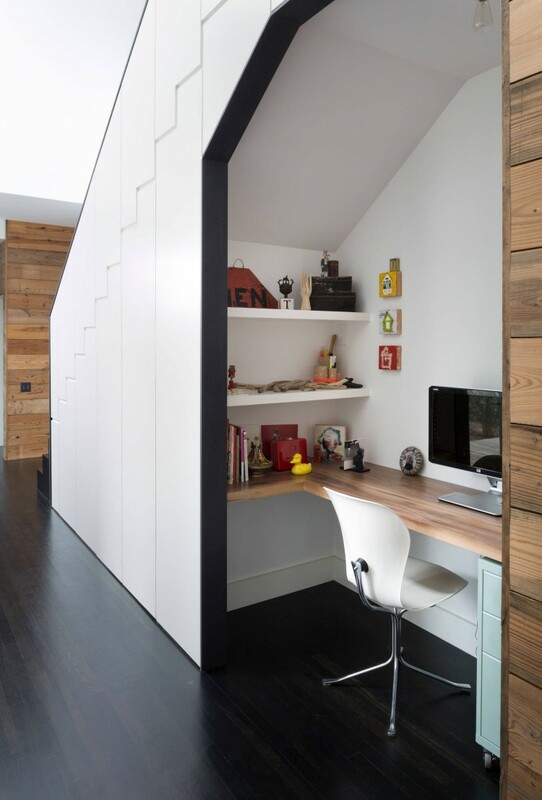 It looks like a small space, but even the smallest space can be utilized in a creative way. 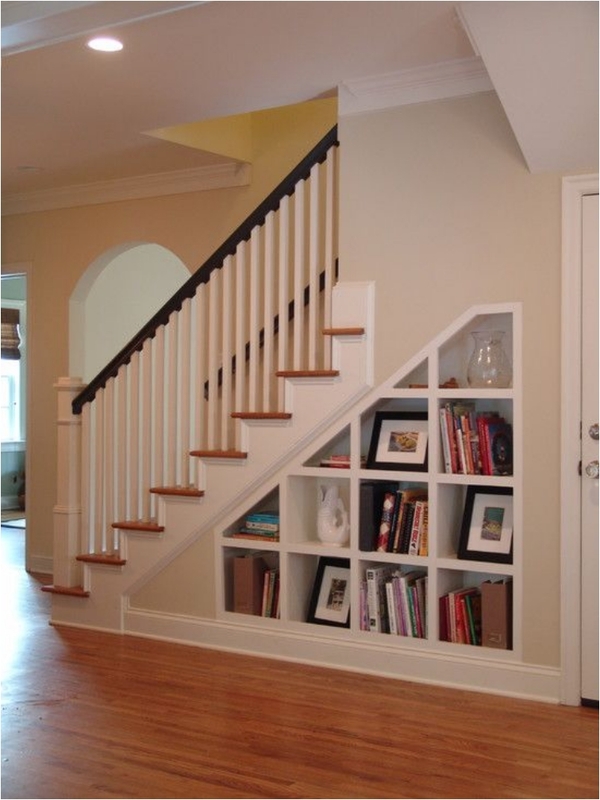 One of the most common ways people utilize the space under the stairs is by turning it into a storage room. 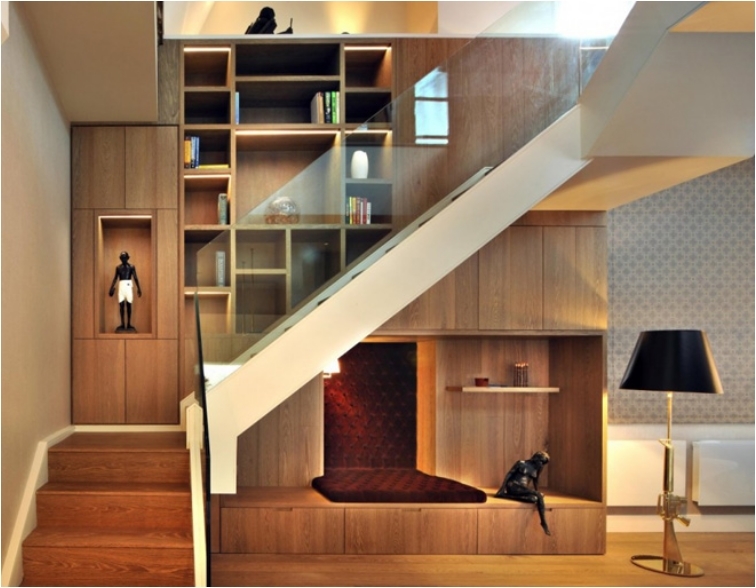 Sliding racks are perfect for this option, as nobody sees what’s under the stairs (visitors and guests see what looks like a wardrobe). 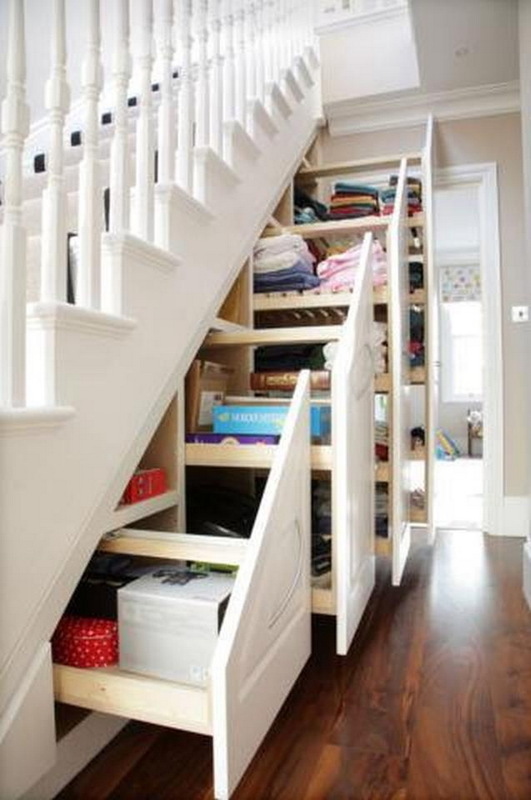 If you want extra space for shoes, clothes, bags, and so on, try to find it under the stairs. This is another storage option. Some people need extra space for their clothes, some people need extra space for food and beverages. It all comes down to how much space you have. 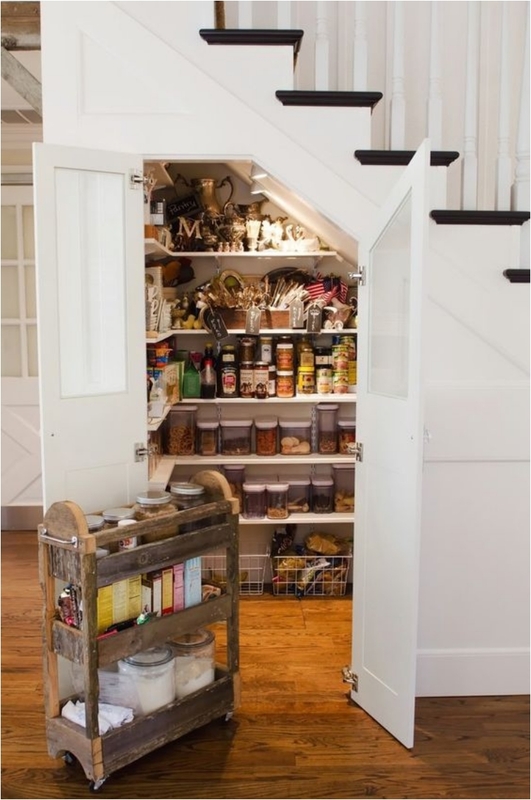 If you have a small space under the stairs, it’s more suitable for a pantry. 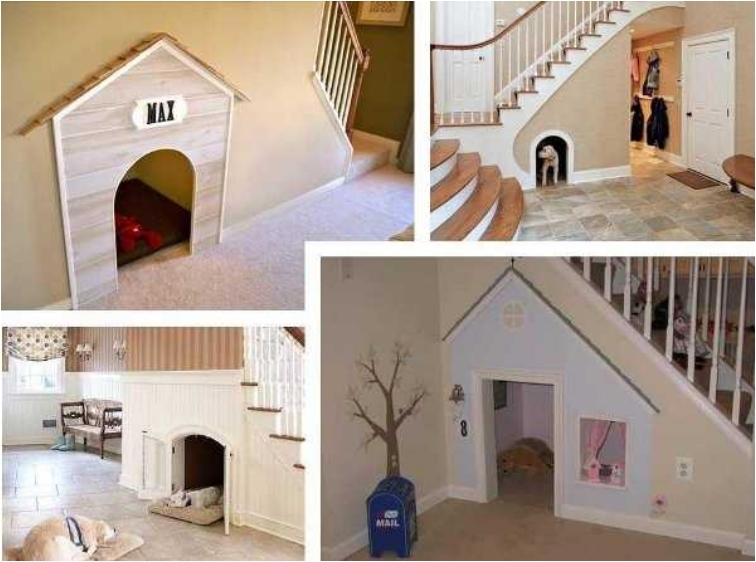 Most people are against having a dog house inside their house or apartment. But this way, you make sure that your dog does indeed have his own space. And to be fair, dogs are part of the family, so welcome them with their own room! Adding mirrors in the home is one of the best ways to make the space look bigger. 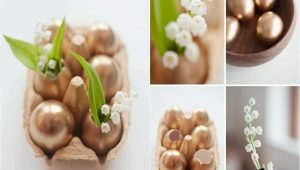 This is one of the optical illusions interior designers love to use, and it’s also one of the staple characteristics of contemporary homes. 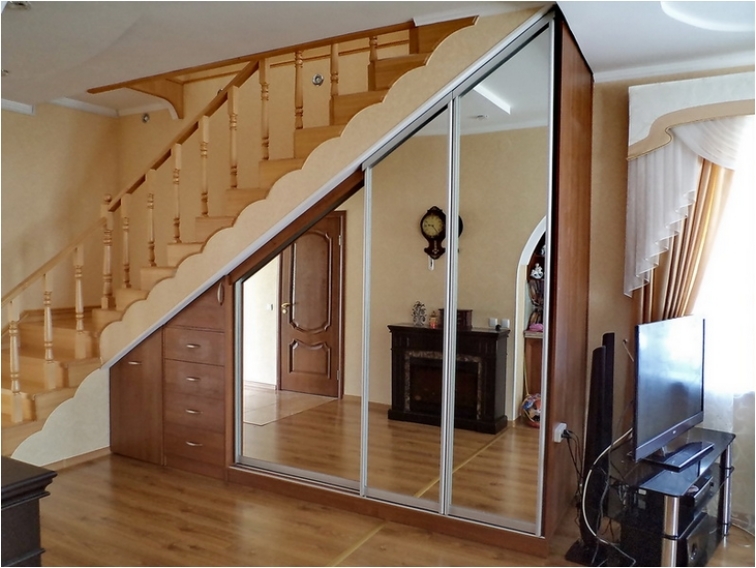 You can go a step further by using it as a storage unit, with just some mirrors included for a larger space effect. 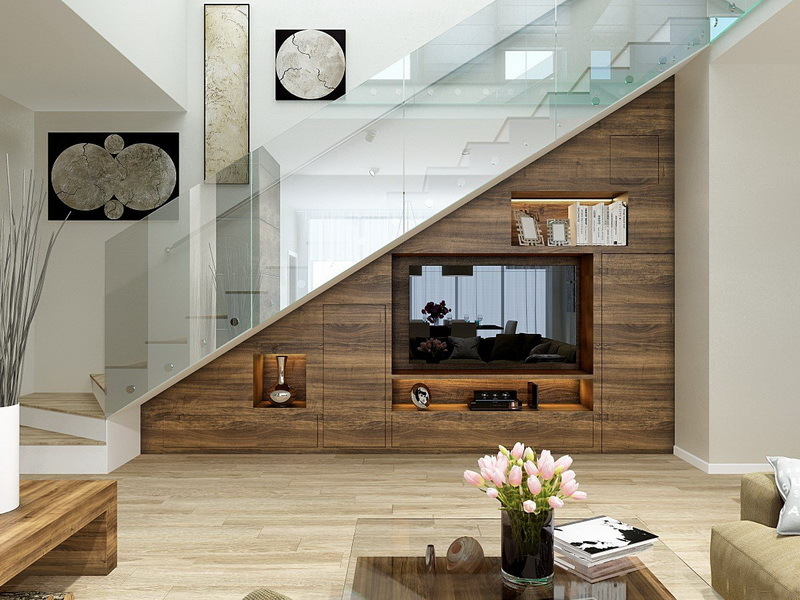 If your living room is close to the stairs, the space under the stairs can be the home for your TV. It really transforms the living area into a cozy and comfortable space. And this solution comes in handy when your living room is not as big as you’d like it to be. 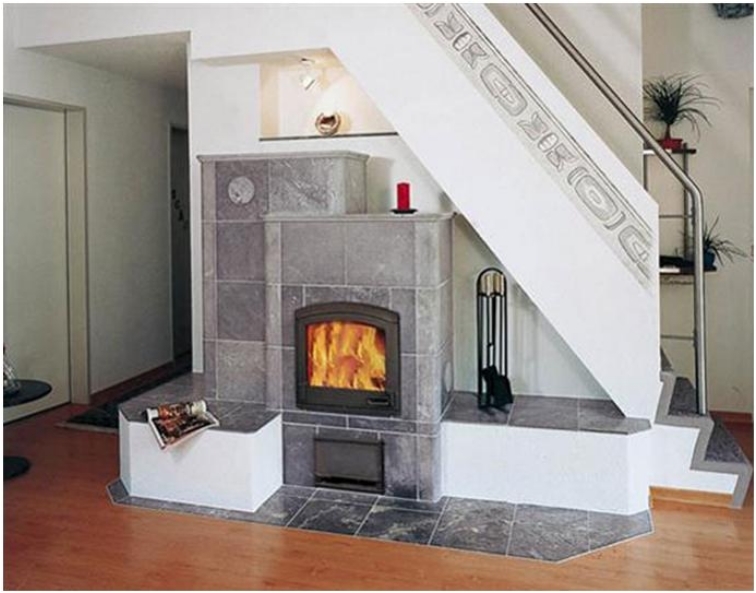 There is nothing more comfortable and cozy in the living room than a fireplace. But some people are just against using wood for heat. I understand that, so if you want to get the coziness, you can always make a faux fireplace. As you can see so far, we’ve had a number of storage options. And it all comes down to what you want to store. And what you like. 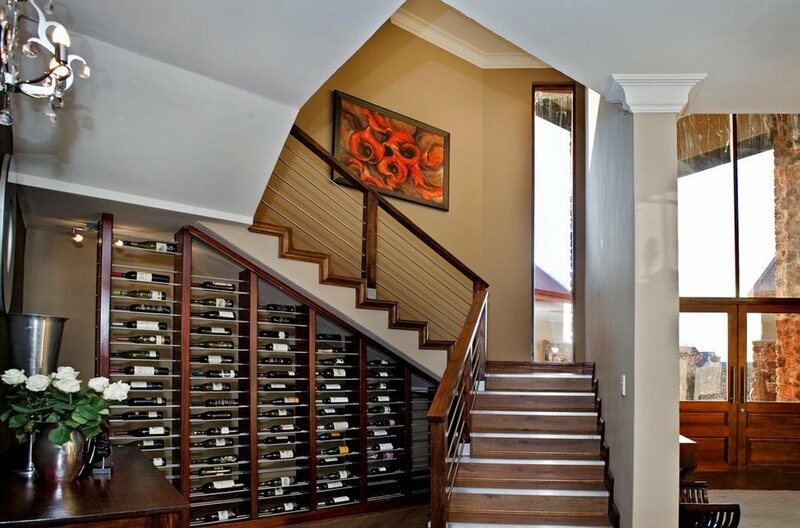 If you are a wine lover, chances are you have a lot of wine bottles in your house. 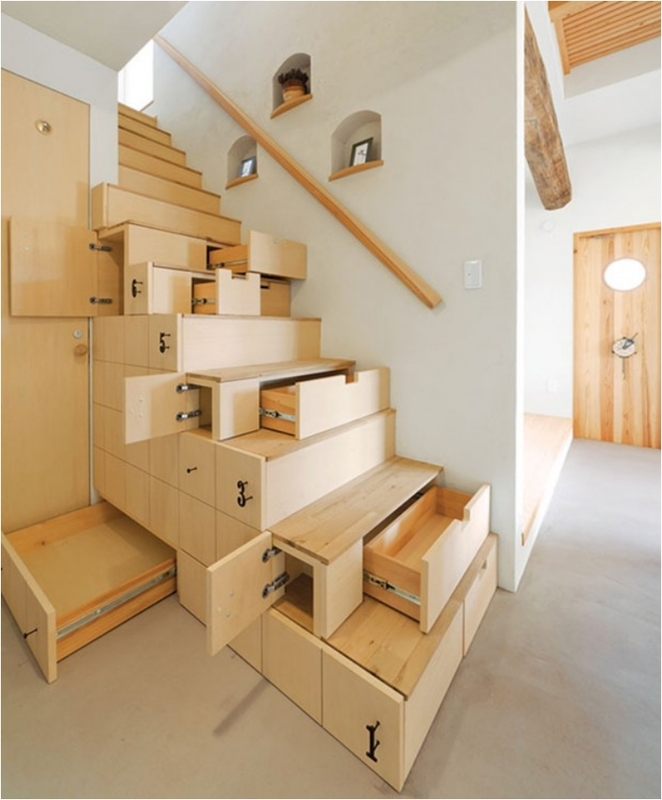 Why not store them all in an organized manner under your stairs? You can say that this is taking the storage solution to the next level. The staircase looks like it’s built from Lego blocks. But that’s the fun part. 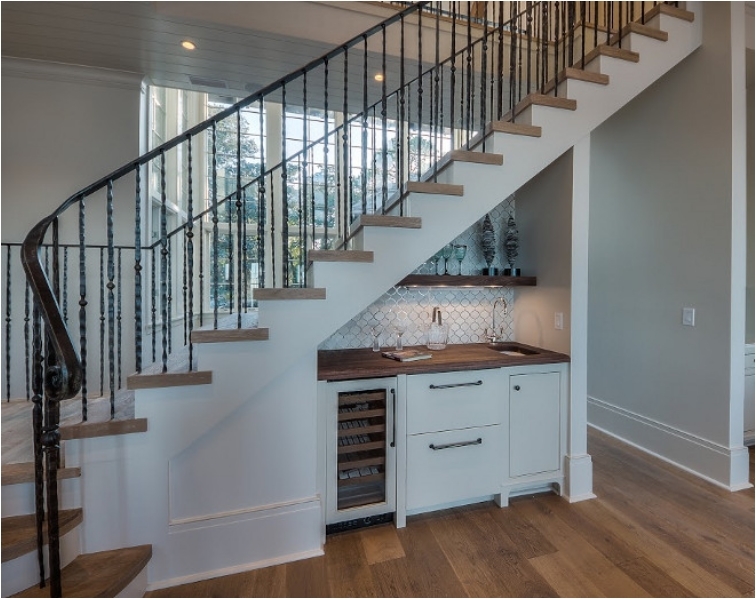 Your staircase will look unique, fresh, and practical at the same time. Just make sure to close the drawers! One thing I always wanted in my home is more space for art. I love art, and I have several pictures that are just lying in my vault. I don’t have a staircase, so I can’t use the space under them for displaying my art. But I wish I had this space. It looks stunningly awesome. 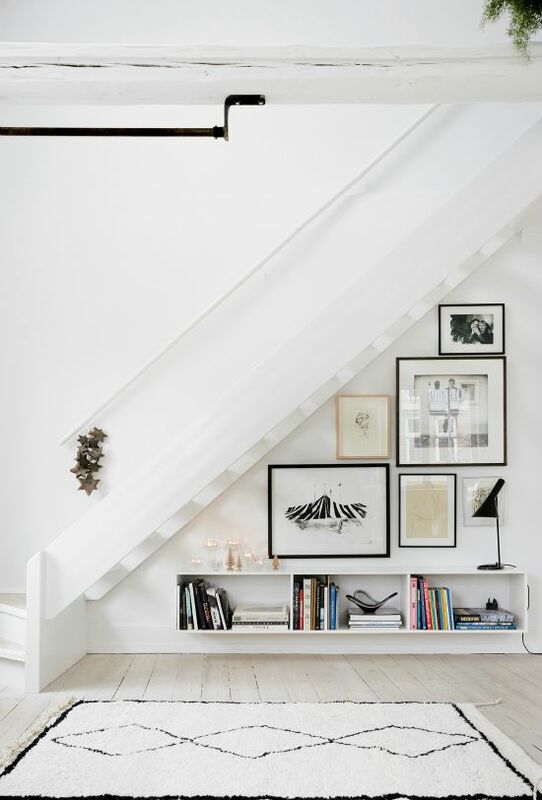 Some people want to use the space under the staircase for storing items, some want to use it for displaying items, and some want to make it practical. If you belong to the third group, you can turn it into a laundry room. 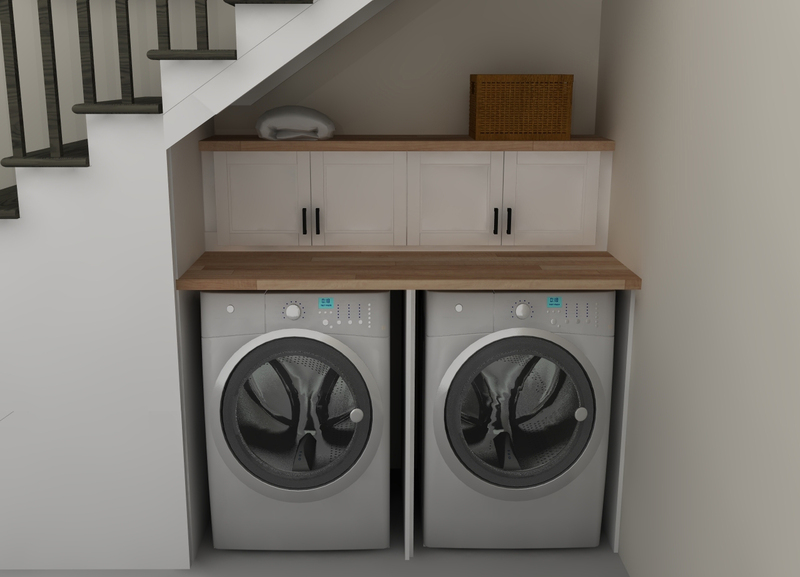 Personally, I want to keep my laundry room out of sight, but if you lack space, you can always use the one under the stairs. I’ve seen a lot of people use this space as a mini office. But a small seating area is also a good idea. You can make it your comfort zone. A place where you can sit, relax, and read a magazine or a book. 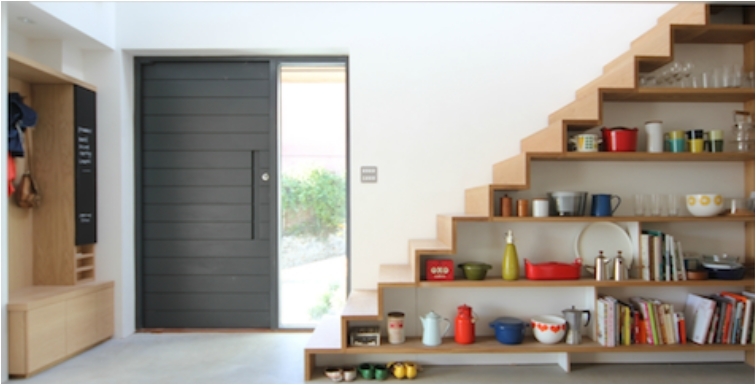 One of the first images I think of when considering the space under the stairs is a bike rack. 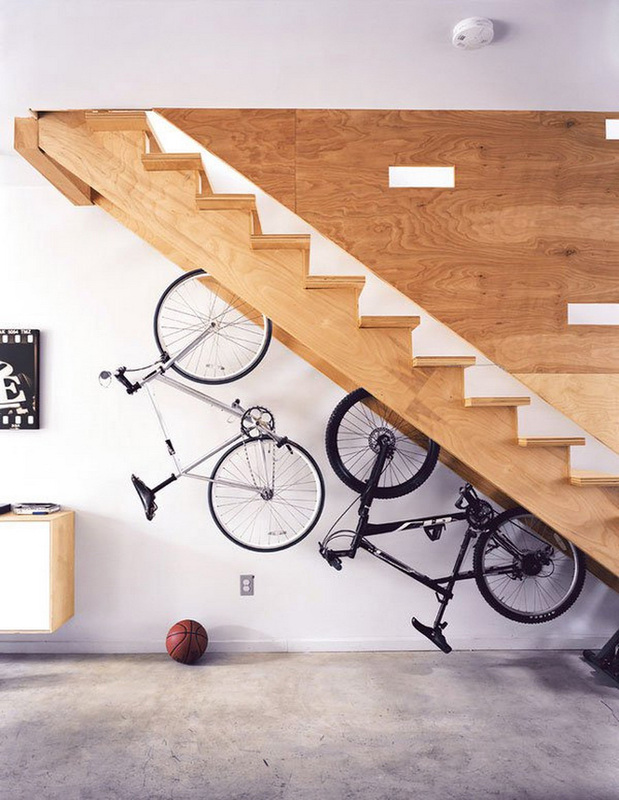 It’s a really clever way to store your bike inside the house. This one really depends on how old your children are. If they are young enough to fit in the playhouse (perhaps 2-3 years old), go for it. Believe me, you will be relieved to know they have another playground. You can let them play inside the house for hours, and they will be thrilled. 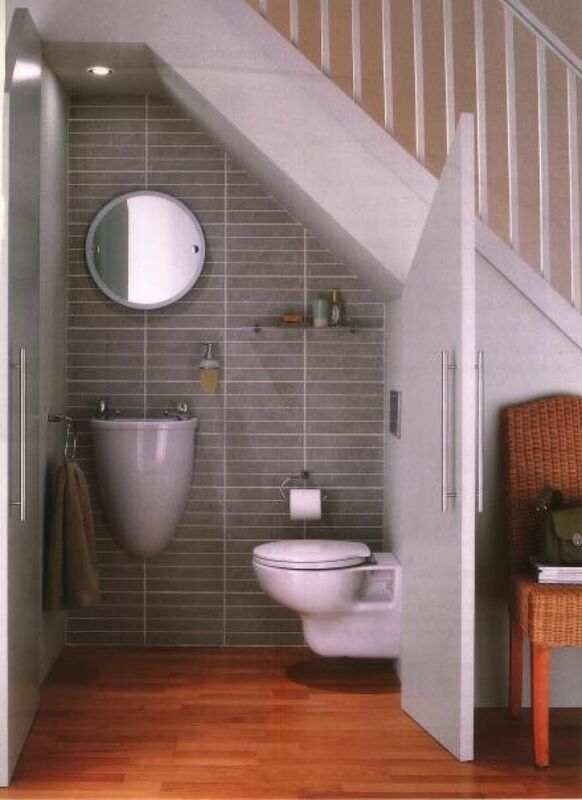 You can utilize the space for a guest powder room. You can never have enough powder rooms, especially if you are keen on throwing parties. When you have some 30 or 40 people at your house, one or two powder rooms might not be enough. 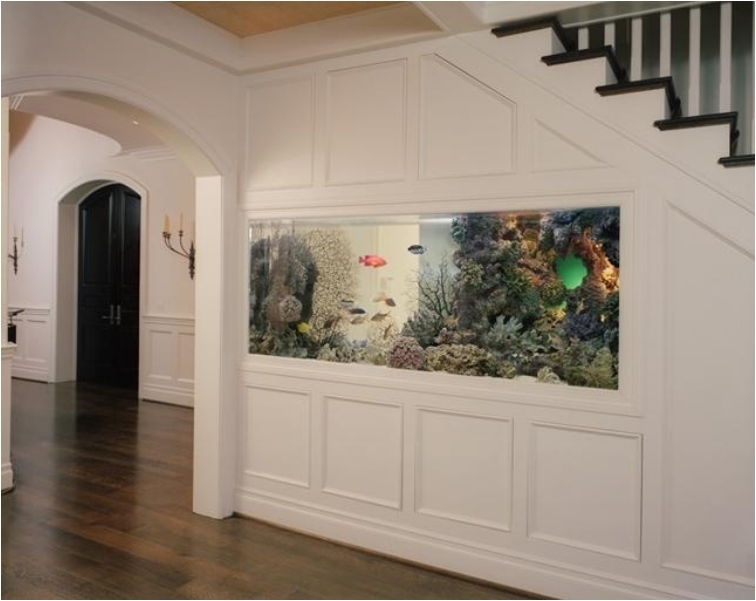 One of the best ways you can make a space look calm and cheerful is with an aquarium. The fish swimming in the water will make it pleasing to stay in the living room and just gaze at it. You want tranquility? Get an aquarium. Personally, I prefer the kitchen to be big and spacious—I love to have space when I’m cooking! 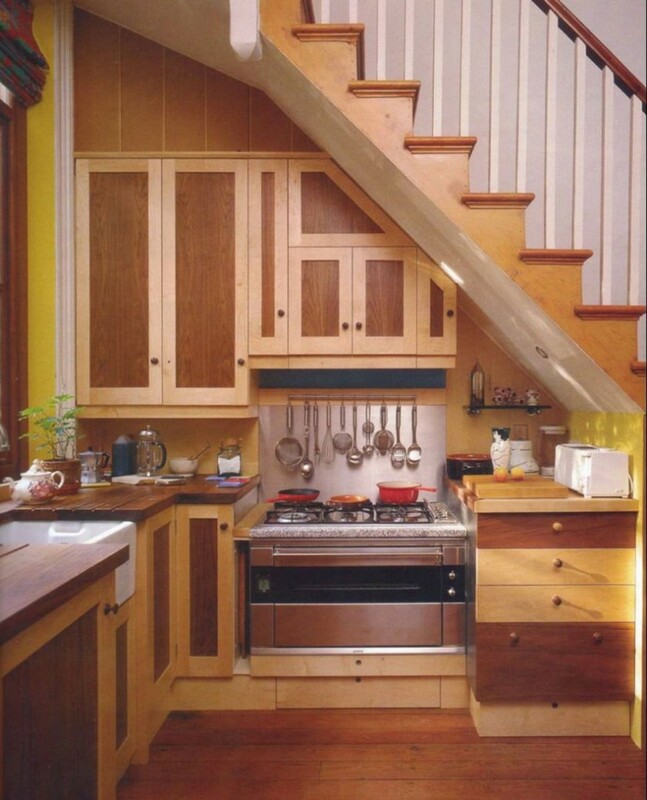 But if you want to fit a small kitchen in the space under the stairs, go for it. You can always leave the bigger room for something else. 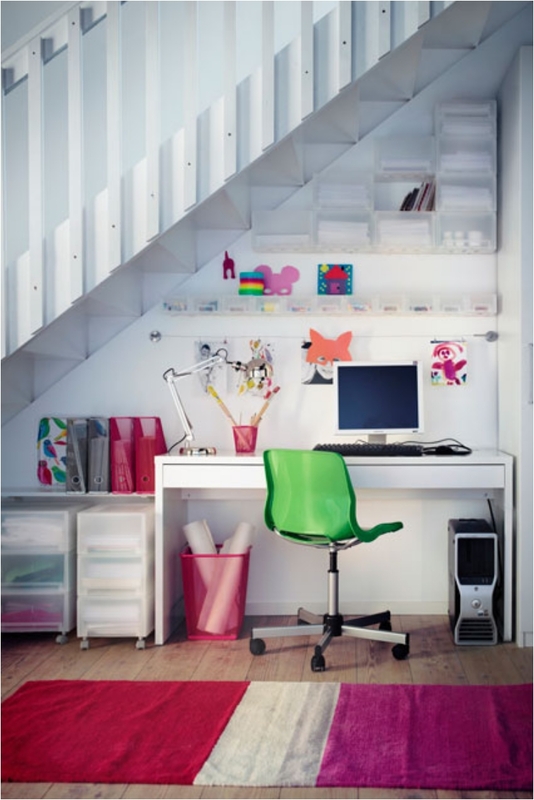 I said previously that the space under the stairs is perfect for a mini office. I know some people feel it’s like they’re being punished when they work in small environments, but I find this office quite cozy and pleasant. It might be troublesome when there’s a lack of natural light, but hey. We had a laundry room, but you can fit any appliance here. And it doesn’t have to be white. 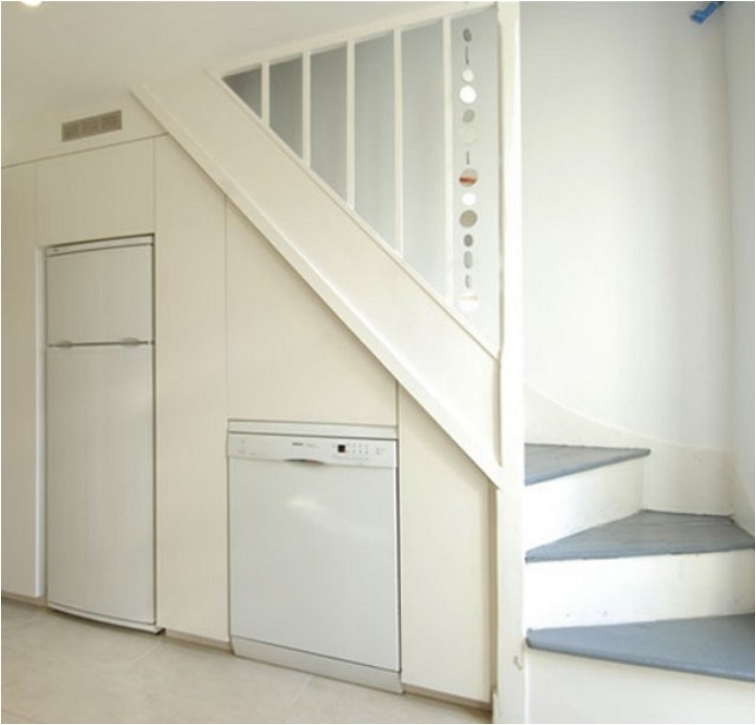 For example, you can have wood with white/silver appliances. 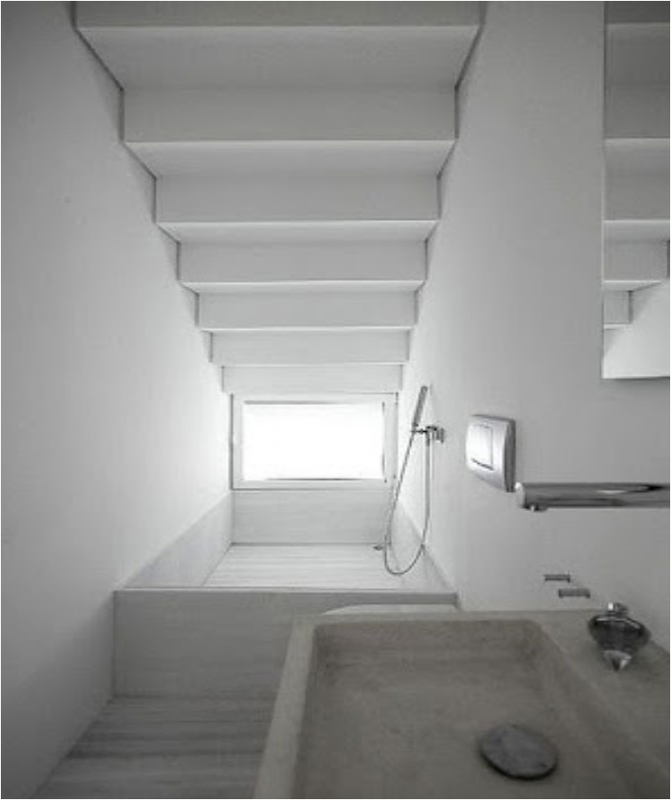 There are many options, but if you want a streamlined look, white is the way to go. In this digital era of technology, not only have we moved away from books, but we’ve forgotten the value of a good book. At least some people have. But there are some of us who still value their books and have lots of them. The reason people went digital is because it takes less space. 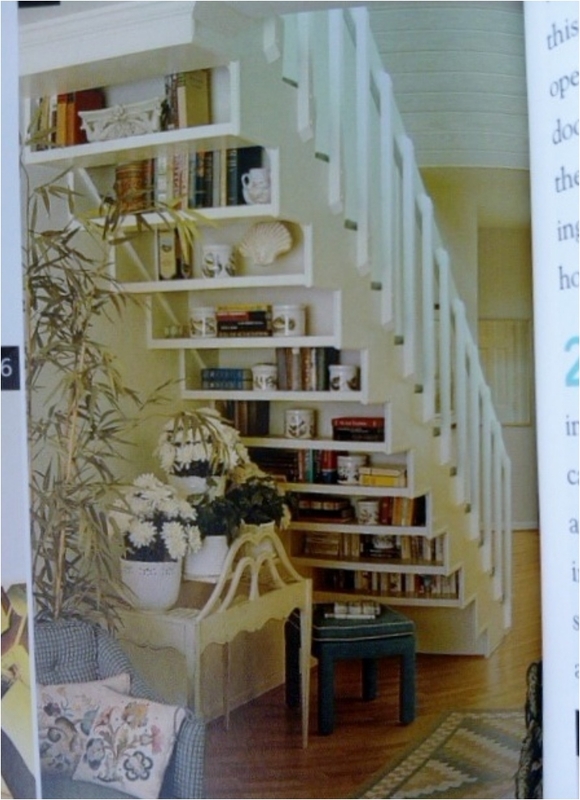 It’s a valid argument, but we need more books, and the space under the stairs can serve as a bookcase. This option is perfect for a contemporary home. 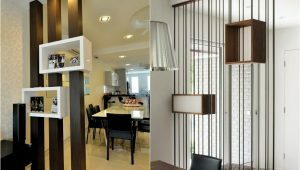 It definitely follows the spirit of a contemporary style, with all that illumination and clear lines. 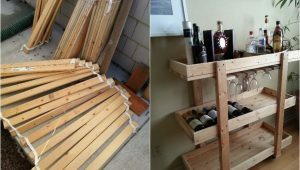 And I love that it combines several storage units, including a wine rack. When you think of a mudroom—the area where we store our shoes, just past the entryway—you think of chaos. But don’t let your shoes and coats be thrown around any which way—decorate your mudroom in a way that it stays organized. 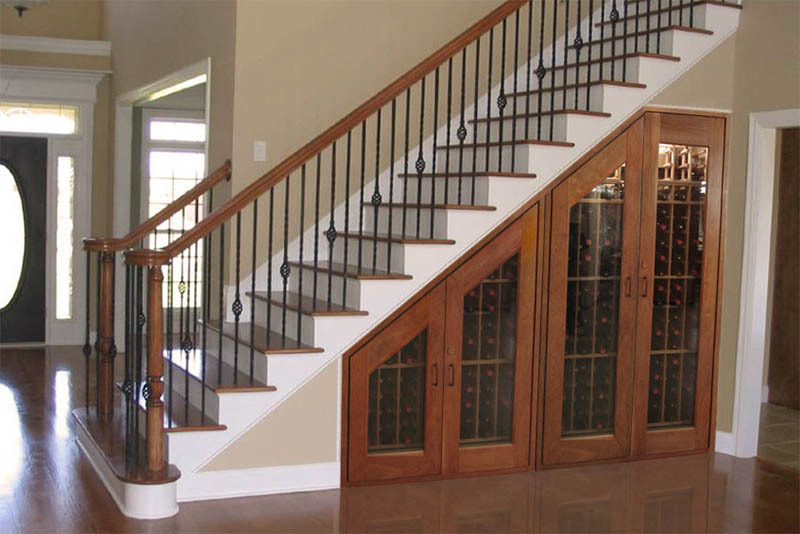 We’ve seen several wine racks for this space. In this example, they are positioned differently—horizontally. This way, you can easily read the labels to find the wine you want. I love this scene in a movie: You come home from a hard day at work, you take off your shoes, and you prepare a drink for yourself. And that’s how you can use this bar on a daily basis. No, I’m not supporting alcoholism, but one drink per day or every two days is nothing serious. We have two types of bathrooms today. One for a calm, relaxing, long bath. And another one for a quick shower. When you’re in a hurry, of course you use the latter. And that’s what you can build under the stairs. This bookcase falls in the category of stylish bookcases you add just for display. Chances are, you’re not going to read any of the books there. But at least your home will look more sophisticated and modern thanks to the books. We had another office idea earlier. But that one was a bit more youthful. And a bit more colorful. This one is a sleeker, more elegant and sophisticated option. Again, you suffer from the same lack of natural light, but if the living room has light, your office will have some as well. And you can organize your office documents around the desk. We had a mini bar earlier. But that was a simple mini bar; this one is more luxurious and glamorous. And I love how the crystal glasses are organized and stored. 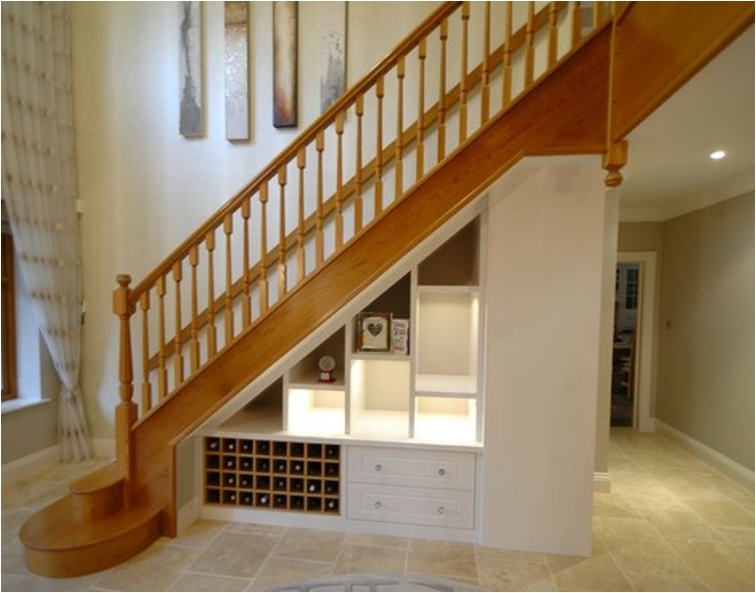 Can’t decide what to store under the stairs? Well, why don’t you store anything you can think of? Books, utensils, kitchenware, some glasses, and everything else. The storage unit is simple enough that you can use it for anything that comes to mind. We finish with a combination of a seating area and a mini library. Yes, it’s a small space, but it’s comfortable enough that you can lie down and read a book or two. Or you don’t even have to read anything—just lie there and let your mind wander! 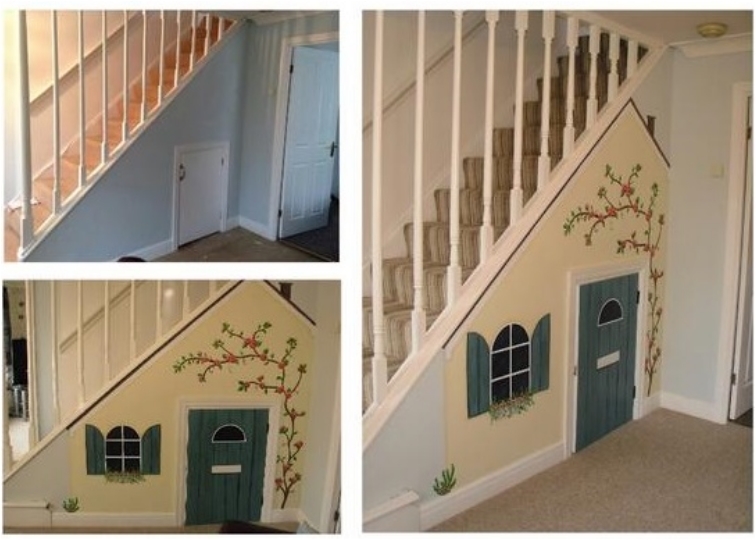 That would be all for our ideas for creative uses of the space under the stairs. If you have any other ideas, feel free to share with the rest of us.